This week was so exciting for me!! 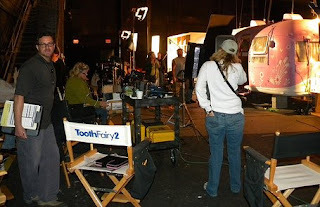 I got the opportunity to go to Florida and visit the Tooth Fairy 2 movie set! Diva Limo service was holding my name up on a sign when I got there to welcome me. The first night I got spoiled with a gourmet meal at Emeril's Orlando restaurant! I loved the atmosphere and the dinner was incredible! 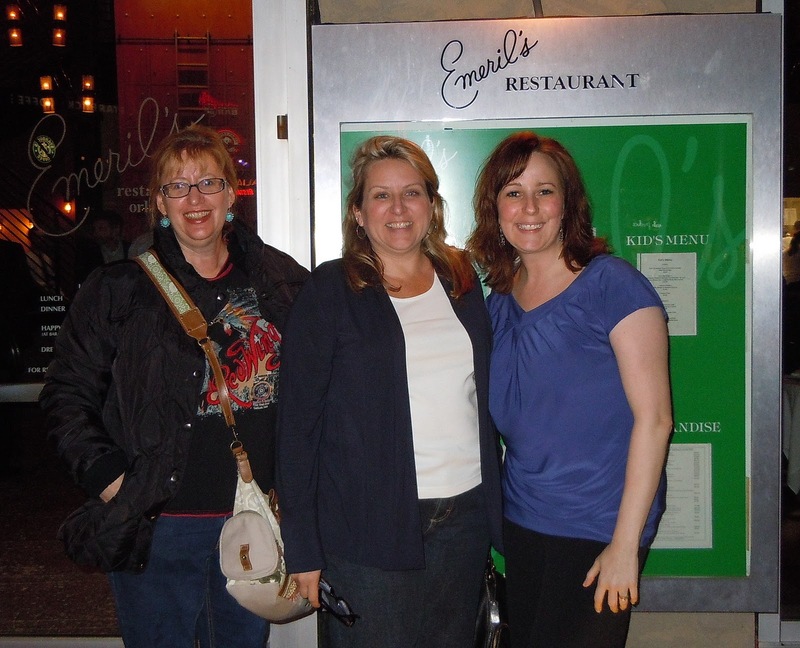 Here I am above with Jennifer, from Fox Home Entertainment, and Wolf, the Unit Publicist for Tooth Fairy 2. They are both awesome and great to hang out with! The next day we went to the set at Universal Studios, Florida. First we got to question the animal trainer and meet Crusher, one of the piglets they are using in the movie. I was impressed by all Crusher could do, he is so adorable! Next I got to hang out with Alan Blomquist, the producer for Tooth Fairy 2! He was great and shared his very inspiring stories. Next I got to hang out with Larry the Cable Guy! We got to interview him. I was dying to ask him what his wife thinks about him in pink tights and a tutu. He laughed and said, "She thinks it's pretty funny." Thanks Larry for making my visit so fun and exciting! It was awesome how welcome you made me feel! Next we headed off behind the scenes of this great production... 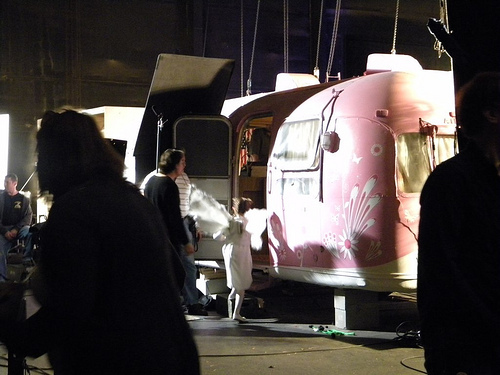 It was so exciting to be there while they were actually filming! Having Larry the Cable Guy in Tooth Fairy 2 is going to be hilarious!! Tooth Fairy 2 finds Florida car repairman and one-time Metro County Miracle bowling champ Larry Guthrie (Larry the Cable Guy) having one bad day. He just learned his ex-girlfriend, schoolteacher Brooke (Erin Beute), plans to marry his arch-enemy, a local politician (David Mackey). When Larry shows up at Brook's after-school program to talk her out of it, his big mouth lands him in trouble as he inadvertently breaks the news to a child that the Tooth Fairy is just a myth. Now, unless Larry collects 20 teeth in 20 days, the Tooth Fairies are going to erase his greatest memory. And unless he can prove to Brooke that he's a changed man, he's going to lose her forever. I'm not sure of the exact release date yet. I will post more about it when I find out. I am honored to have been able to see some of the making of the movie. I can't wait to see the Tooth Fairy 2 movie when it comes out! It's going to be so funny! This was a great trip hanging out with incredible people! Thanks again to all that made it possible! What a fantastic experience! What an amazing trip. This looks totally awesome. I can't wait to hear more about the movie. I bet my kids would love it. Be sure to keep us updated. Awesome Shauna! They sure picked the perfect person to be on the set and write about it! Looks like you had a great time. I can't wait to see Tooth Fairy 2 after reading this post. I love Larry, I am definitely going to see this one. Great post! Had a great time in Florida and glad I got to meet you. What a wonderful post! It was great to meet you in Orlando! Hopefully we'll get to do this again soon! Sweet! Sounds like it's going to be a funny movie. That is cool you got to be on the set and see them filming. I always enjoy reading your fun posts. Very cool, how exciting for you. Shauna! What a great time! And seriously, who doesn't love Larry the Cable Guy?! I will definitely go see this movie for sure! Wow!! that sounds so awesome. I cant wait to see the movie!! How exciting!! How super to visit a movie set! Can't wait to see Tooth Fairy 2 when it comes out. Thanks for sharing this awesome post with us Shauna! Wow, that is so exciting! Good for you for going and having a great time. Yay for friendly Larry!! Sounds like you had a terrific time! So Cool! That was a wonderful trip you got to go on. I'm soooooo glay you got to go. I love the pig the best, of course Larry looks pretty neat too. Your Post is great! What an incredible experience! Looks like you had a great time. I am excited to see that movie now. Thanks for the super post Shauna! Great post! It was so much fun meeting you and going on set together! You look like you had a blast. You are the best blogger so you deserved to go! I'll definitely be going to see the movie...in fact...we should go see it together since I LOVE PIGGIES!. How exciting! My kids will love this, I'm sure! Looks like a fun trip! :) We loved the first Tooth Fairy movie. That was awesome! Glad you got to have a fun adventure. Thanks for following me on The Copper Brick Road! I am now following you! Following back! Love Larry the Cable Guy--he's from Nebraska like me! My kids loved the first Tooth Fairy. Hope the second is just as good. Looks like an amazing trip. I would have loved to taken your place! Thanks for stopping by my blog. Looking forward to getting to know you! Thanks for visitng my site and following me. I am now following you back! What a awesome trip! Sounds like you had a lot of fun. I can't wait to see the movie. I know my daughter and my husband and I would love this movie. How great!! Love Larry the cable guy! Looks like it was fun! Excited to see this movie!